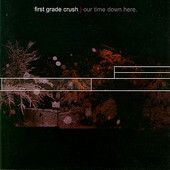 Playing fast-paced punk rock with a slight ska touch, First Grade Crush's Our Time Down Here at times sounds young, and youthful, though the band overcomes any downfalls this may provide the album by playing extra energetic. Coming across as lively on disc, they must be extra sweaty live. Our Time Down Here suffers from sounding too generic, a run-of-the-mill punk record that wants to expand beyond, especially with the ska, but besides adding horns, isn't quite sure how to accomplish the goal. They seem stuck between trying to figure out what they want to do, but this will come with age. As I said before, they're very energetic and if you're looking for a fast, fun disc that will provide you a lot of bouncing and dancing entertainment, this might be your ticket. I'll give it a C-.